West Delray Updates writer, Glenn Weiss, has examined the plans by 13th Floor and proposes improvements. Weiss holds a Master of Architecture from Columbia University, served as the architecture writer for four Seattle publications, taught architectural design and suburban planning at FAU and University of Washingtona and worked as a senior planner for the City of Coral Springs. My objective of this analysis is to protect the environment and views for Palm Greens residents. 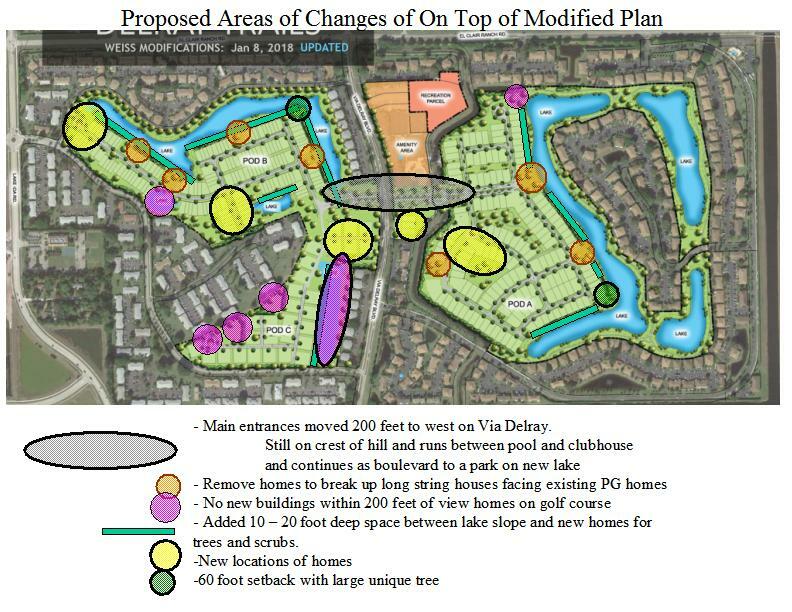 In modifying the design for Palm Greens, I also believe that the layout is improved for Delray Trails owners. Of the improvements proposed: two have the most impact on the design for the community and 13th Floor. The first change moves the Via Delray entrance to the west of the clubhouse in order to move POD C buildings. Moving the six buildings creates the space for a new lake, and therefore all existing homes adjacent to golf course will have 200 feet of lake or green. The plan to be as fair possible. The second change requires 13th Floor to add 10 to 20 feet between the Delray Trails homes and the slope of the lake. At least one tree or palm cluster will be planted for each unit/home and guaranteed permanent in legal agreements. We all know the view of homes against lakes with only a grass slope before the line of patios with furniture and other objects. All of these proposals are COMPLETELY possible. Please don’t believe any excuses except that 13th Floor may lose a few homes to sell. They are very, similar to the types of changes recommended by professional planners everyday. Goal: Equal final result for all existing units with view windows adjacent to golf course property. Recommendation: Minimum 200 foot distance between property line and rear wall on new homes. The distanced to be fill with open green space or lake. Trees and scrubs will be planted at the back on new homes. Goal: Equal final result for all existing units with view windows looking across a road or canal to golf course property. Recommendation: Minimum 30 foot buffer with a 3-foot berm, six foot hedge and two two rows of trees. Goal: Make the backs of the new homes an attractive image to Palm Greens residents. Recommendation 1: A 10 to 20 foot wide space with trees, palms and scrubs between the slope of the lake / canal and the property line of individual Delray Trails units or homes. At least one permanent tree or three palm cluster per unit. Recommendation 2: A maximum of 500 feet of a line of buildings without a break of 100 feet for green space, lake or parking. Recommendation 3: Decorative window and door surrounds, no plastic fences and Delray Trail rules prohibiting furniture left outside when the owner is gone more than 2 weeks. Goal: Preserve and improve the quality of the walk around former golf course. Recommendation: Along Via Flora, Via Aurora, Via Delray and Palm Greens Way where Delray Trails or Lake Worth Canal touch theses roads, the sidewalk will be a minimum of 5 feet wide in the center of a public 20 foot green zone with trees. Recommendation: Various smart building placement and landscape elements to improve the quality of development. The Atlantic at Delray Apts. Two golf courses going. Two threatened.